Please note that for the next few weeks I will only be able to answer emails on Monday, Tuesday and Wednesday mornings. I apologise for any inconvenience this may cause. Small cosy retreat, 1 hours drive from Auckland. Cliff top views of Manukau Harbour and Auckland City lights. Very private and quiet. Bathtub under the stars overlooking the bay and the city. Close to golf course, winery, light house and beach for swimming. The property has been designed to suit a responsible couple who want a private, quiet, relaxing break away from it all. 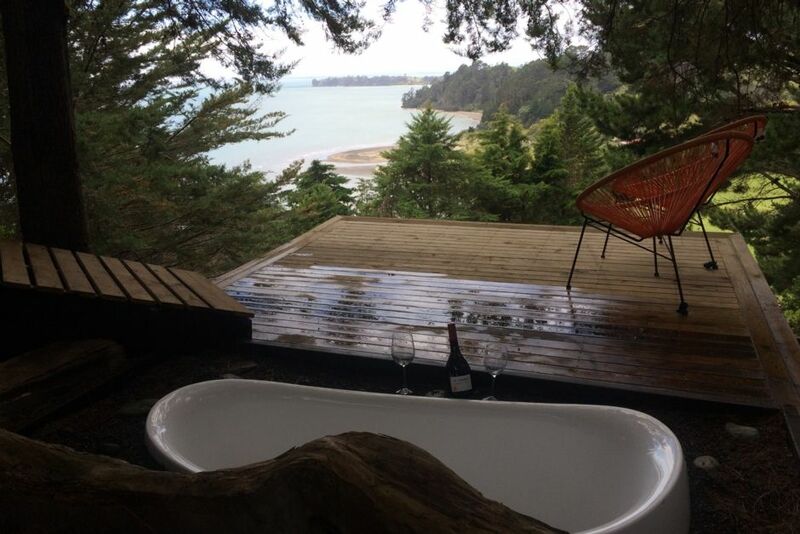 There is no TV or stereo, only the lapping of waves on the beach below, the wind in the pine trees and the occasional tui. Take a book and relax or, if you prefer, there are local activities (golf, fishing, walking, etc). Only 1 hours commute to Auckland city. This property is not suitable for children and/or extra guests (maximum 2 responsible adults). No smoking, pets, drugs, parties. No smoking, pets, parties, drugs. Maximum of 2 responsible adults, no children. Handy to winery, golf course, beach, light house, farm, fishing, beach for swimming.. Romantic escape for two. Private setting with everything required available. Romantic escape for two. Private setting with everything required available. Close to beautiful Awhitu Regional Park, numerous bays and Awhitu winery. Great community vibe with local arts, crafts and preserves sold at Co-operative Gallery. Outdoor sucken bath was a highlight set in a private walkways with beach views.